Why should we deal consciously with rainwater? How does rainwater harvesting work? Rainwater Harvesting for a Green World. A universal water level gauge, indicating water height between 1 and 3 m. Maximal distance between storage tank and indicator 50 m. Water level is indicated by manual testing. 10 m indicator line included. For wall fastening, housing made of plastic. Universal connection for pipe or hose with an external diameter of 6 mm. Housing is mounted on the wall. The level of the water in the tank has to be setted before initiation of the equipment. 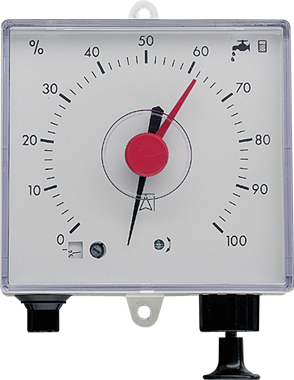 For metering the fill level you have to activate the lever thus generating a vacuum in the measurement connection. Reading of the fill level is in %. Pneumatic measuring instrument for water, housing made of ABS.